Derby is the UK's most central city with a great cultural base and situated on the edge of the Peak District National park. Derby - Travel by coach - If you'd like to speak to someone about your journey you can ring Traveline on 0871 200 22 33. Derby - Travel by train - Derby Station, Railway Terrace, Derby, DE1 2RU. CCTV. Ticket office. Waiting room. Refreshment facilities. Pay phone. Shops. Toilets. Wheelchair accessible toilets. Whole station step free access. Wheelchairs available. Derby - Travel by road - Derby is about 7 miles west of Junction 25 of the M1 Motorway. The M1 is a north - south motorway which links London to Leeds. Derby is about 120 miles from London and 80 miles from Leeds. East Midlands Airport, Castle Donington, Derby, DE74 2SA. Tel: 0871 919 9000. Duty and Tax Free shopping. Aviation Gift and Hobby Centre. Boots the Chemist. International Currency Exchange. Spar World News. 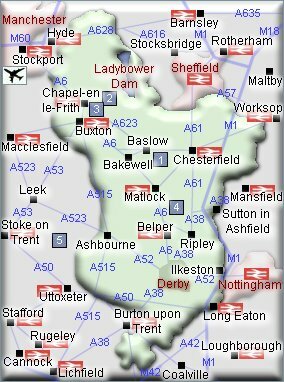 East Midlands airport is about 8 miles from Derby. Derby - Sport - Sports fans have Derby County Football Club & Derbyshire County Cricket Club. Derbyshire County Cricket Club. Telephone 01332 383211. Derby County FC Pride Park Stadium Pride Park, Derby DE24 8XL. Tel: 01332 202202. Ten Pin Bowling. Derby Tenpin, Foresters Leisure Park, Osmaston Park Road, Sinfin Lane, Sinfin, Derby, DE23 8AG. Tel: 0871 550 1010. Derby - Shopping - Marks & Spencer, 7 St Peter's Street, Derby, Derbyshire, DE1 2AG. Tel: 01332 348641. Derby Kingsway Simply Food - Kingsway Retail Park, Rowditch Place, Derby, Derbyshire. Tel: 01332 370943. British Home Stores Derby - 59-61 St Peter's Street, Derbyshire, DE1 2AB. Tel: 0845 8410174. Woolworths - Southgate Retail Park ,Normanton Road, Derby. DE23 6UQ Tel: 01332 343279. Derby - Entertainment and attractions - Derbys Museum and Art Gallery boasts the worlds best collection of the paintings of Joseph Wright. The Silk Mill is Derby's Museum of Industry and History. Derby Playhouse is recognised as an outstanding ambassador for the city. Showcase Cinemas Derby, Booking Line - 0871 220 1000. Derby Playhouse, EAGLE CENTRE, THEATRE WALK, DERBY DE1 2NF. Box Office 01332 363275. Derby Gaol and Pie Shop, 50/51 Friar Gate, Derby, Derbyshire, DE1 1DF. Tel: 01332 299321. Derby Industrial Museum, Silk Mill Lane, off Full Street, Derby, Derbyshire, DE1 3AR. Tel: 01332 255308. Pickfords House Museum, Pickfords House, 41 Friar Gate, Derby, Derbyshire, DE1 1DA. Tel: 01332 255363. Royal Crown Derby Museum, 194 , Osmaston Road, Derby, Derbyshire, DE24 8JZ. Tel: 01332 712841 Fax: 01332 712863. For hotels accommodation in other areas nearby see Ashbourne hotels & Burton-on-Trent hotels. Derby is about 7 miles west of Junction 25 of the M1 Motorway. Rail Stations (Not all stations shown). There is a station in Derby.